We help people get creative, have fun with art materials, try out new ways of working, and start their own creative adventure. 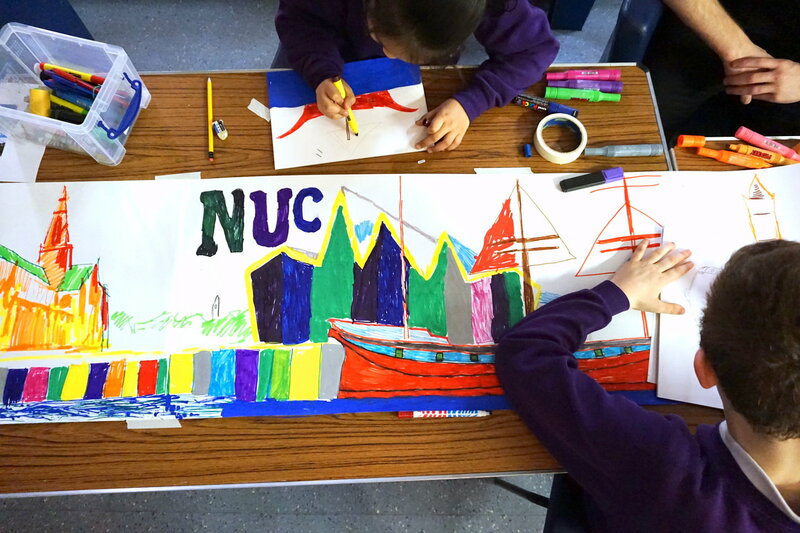 In 2016 we began a series of free community art classes in the north, west and east of Glasgow, helping young people, adults and those disadvantaged in some way to get creative and have fun with artwork, providing free materials and plenty of guidance and enthusiasm to help build up skills and confidence. 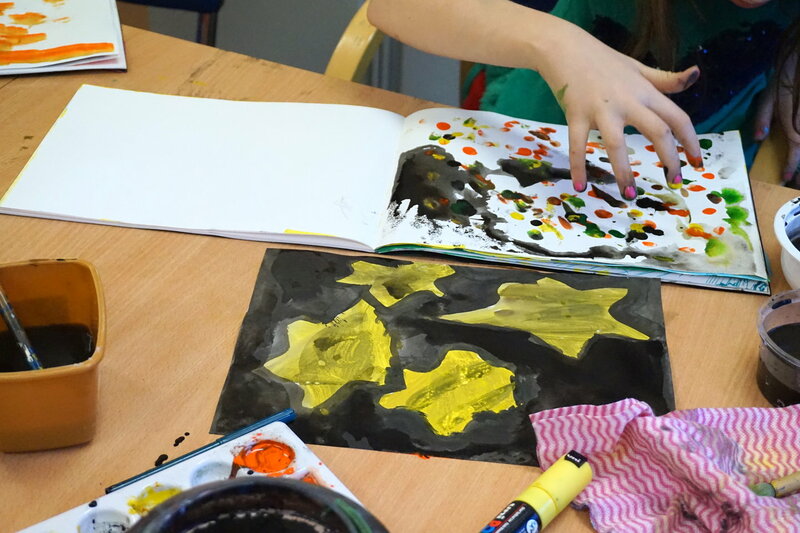 The ‘Sketchbook Adventure’ groups for Winter 2016/17 in Ruchill and The Maryhill Hub gave sketchbooks and materials to young people and adults and experimented with collage, drawing, doodling, figure drawing, and working from imagination. 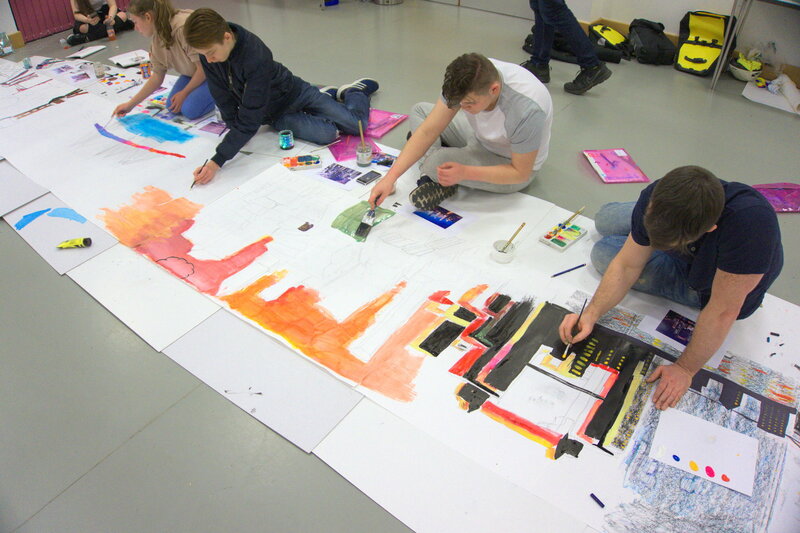 Since then we have worked on joint group work, such as at G15 Youth group in Drumchapel and with adults at The Maryhill Hub, which is a super way to help folk work together and free up creatively and with their own mark making. From January to March 2017 we worked with Two Hours Limited and Glasgow Life (part of Glasgow City Council) on an experimental publication ‘Future’ combining art and literacy as part of their theme ‘Learning for the Future’ for the Aye Write! Book Festival. 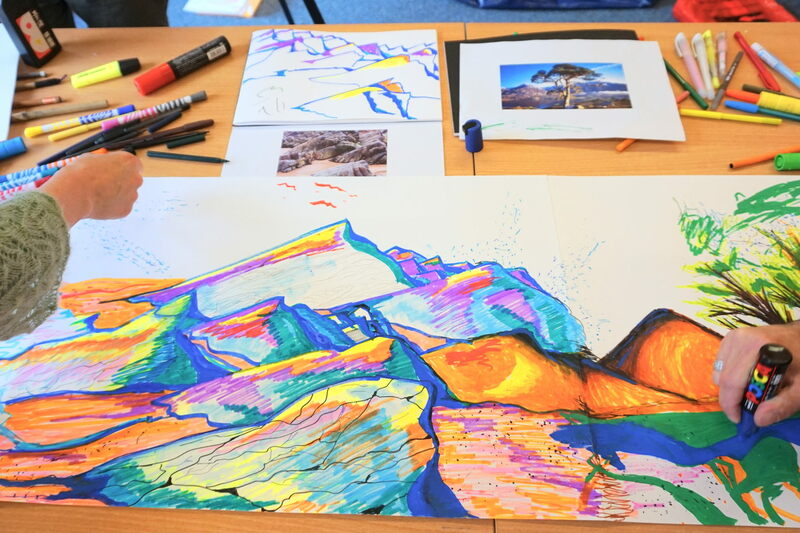 In this project we helped bring together writing and drawings from adult learners across Glasgow, breaking down the boundaries between literacy and art and encouraging participants to use different ways of expressing themselves. We have worked with Charities and other bodies and companies, such as North United Communities, G15 Youth Group, Two Hours Limited and Glasgow Life, Parkhead Artist in Residence, often in local community centres. 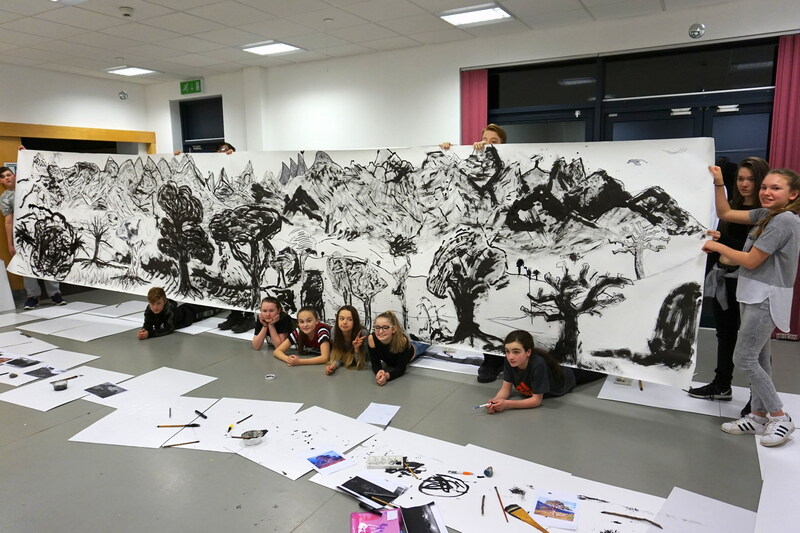 G15 Drumchapel artists on completion of their large Suibokuga ink scape on 7 metre roll of paper! 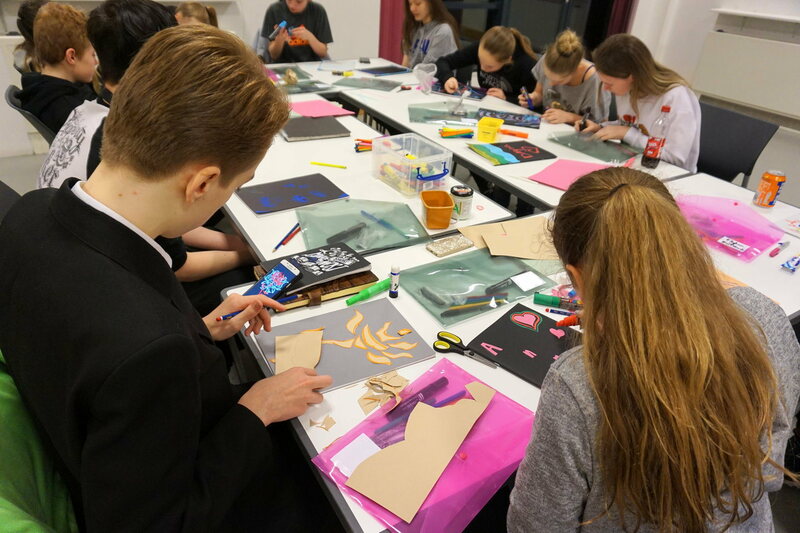 The D+P Studio run wellbeing, creative and art sessions and workshops for any age groups in Glasgow and the wider area, for primary and secondary schools, care homes as well as alongside charitable and community organisations. Would you be interested in a creative wellbeing sessions that are fun, relaxing and nurture the personal development and expression of your group? We also engage with individuals on a one to one basis. The arts are inspiring, joyful and enchanting – for everyone – they encouraging many health and community benefits, having fun and bringing people together. 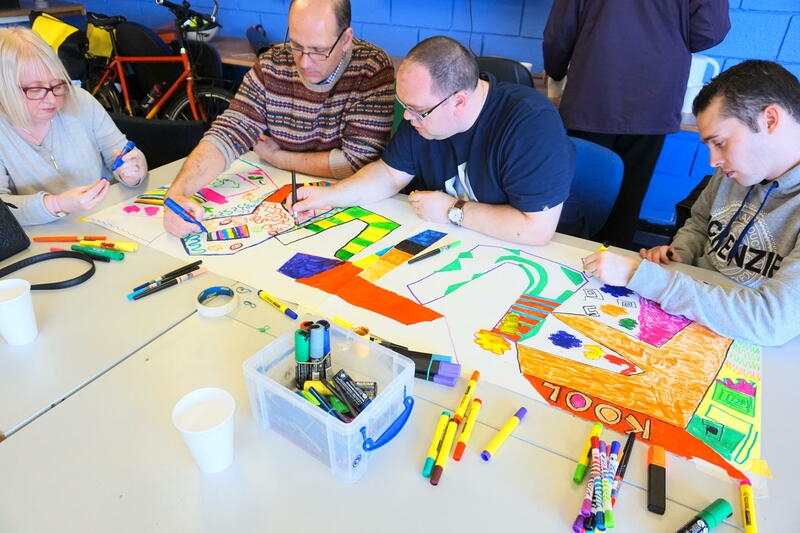 Our focus is always on the groups and individuals we work with to creatively express themselves, increase confidence and participate regardless of their ability or whether they have any experience. Please contact us to ask about a creative bespoke project. Like the acrylics. Confident to have a go. Try new ways of looking and conceptualising. I enjoyed colouring in the picture of Australia and using the paint pens that came from Japan. I enjoyed everything. Especially colouring and writing. The paint pens were bright and fantastic. I feel more confident and proud of my work after these art sessions. I have enjoying everything! With Blair I drew a pool table and a ninja warrior in UK. Quality colouring pens. I feel better about my artwork and would like to share it with other people. The big artwork we did together was fun. The brushes were nice to use. I enjoyed doing the large ink piece because we were able to draw our own concepts for the piece. I enjoyed using the ink. The group made me feel more confident to use different materials while drawing or doing art.